This book aims to bind together latest theories on creation of innovative clusters and operating modalities, empirical analysis, and several new formal models describing cluster formation and dynamics. Another objective of the book is the analysis of the role of the innovative activities on the economic performances of the firm during the crisis, focusing the attention on the complementarities existing among the innovative dimensions, hypothesizing a positive role of integrated innovative strategies in increasing the firm resilience to the challenges brought by the economic crisis. The part of empirical analysis contains a comprehensive survey of different international legislation sources useful for deep studies of influential factors and peculiarities. In this book international statistical reports on economic activity and business cases of successful application of clusters model are described for Western Europe and BRIC. 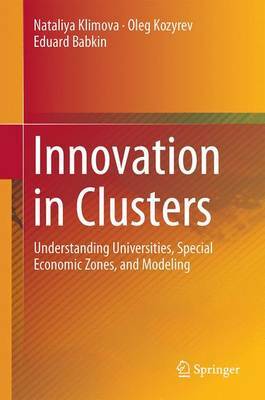 This book also presents authors findings in the domain of mathematical and simulation modeling of the major elements of cluster and innovation management.